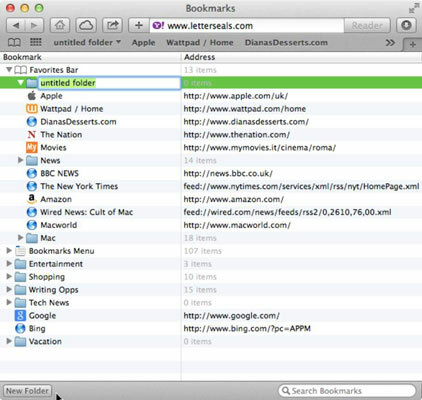 Safari saves your bookmarks and bookmark folders in the order you create them, adding them to the bottom of an ever-growing list. If you continue to add bookmarks to the Bookmarks menu without placing them in folders, you may find that you have a gazillion bookmarks listed willy-nilly and can’t remember what half of them link to. In Safari, choose Bookmarks→Edit Bookmarks. Or click the Sidebar button and then click the Bookmarks tab. Click the folder you want to move or delete (Sidebar) or click the disclosure triangle next to the folder name that contains the bookmark (Bookmarks Editor). The contents, which might include bookmarks and additional folders that contain other bookmarks, are listed below. Click the additional folders to see the bookmarks contained within. You may need to repeat this step several times to find the bookmark you want. Click and drag the bookmark or bookmark folder you want to move up or down the list to a new folder or position. Drag the bookmark or folder beyond the last item in a folder to move it out of the folder. A line shows where the item is being moved to; if you move it into a folder, the folder is highlighted. Safari moves your chosen bookmark to its new location. Click and drag bookmarks up and down within the collection or folder to change the order in which they are displayed. In the Bookmarks Editor, click the bookmark that you want to delete and press Delete. Or, in the Sidebar, control-click the undesired bookmark and choose Delete from the pop-up menu. You can also delete a folder this way, but all the bookmarks and folders within the deleted folder will be deleted. To restore a bookmark you mistakenly deleted, press ⌘+Z or choose Edit→Undo Remove Bookmark. Choose Bookmarks➪Hide Bookmarks Editor to return to the most recent web page you viewed or click the Sidebar button to close the sidebar.